Giffnock Soccer Centre prides itself in developing young people and, while football is the medium used across the club, part of this development process also has to ensure that the youngsters health remains at the forefront of what we do. The club is therefore delighted that Business Club 50 partner Mearns Opticians is able to provide us a specialist’s view on how sport can be enjoyed by all the club’s community. This is the first in a regular series of articles which should be of interest to all the players and their families. 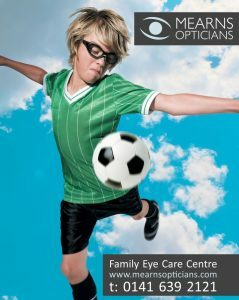 More information s available from the team at Mearns Opticians. So this is it, finally we have a blog! At Mearns Opticians, we spend most of our time looking after people’s eyes – which we love and will continue to do – but we also wanted to be able to spread the word about some of the other ways that we can help. I think it’d be safe to say that most of us take our eyesight for granted. When we wake up, many of us will give our eyes a wee rub and get on with our day. As part of our daily “getting ready” routine, some of us will put on glasses and some may insert contact lenses. But once done, we’re all set for whatever the day brings, and we don’t really think much more about having good vision so that we can meet the day’s challenges. Except sometimes, our eyes let us down. A family might want to go for a drive at the weekend but the driver left his driving glasses in the office, or a busy mum gets some down-time and wants to read her magazine but she can’t find her reading glasses. So the youngster that needs their glasses for most normal tasks needn’t despair, because we provide sports eyewear for children and adults, which means that they can swap their normal glasses with funky sporty ones with prescription lenses for playing their favourite sport. There’s lots more to what we do, and if you want to find out more, please pop in to our Broomburn Drive practice for a chat.